While gathered around the lunch table with co-workers today, the conversation turned, as it so often does, to plants. Today’s conversation included a lament that straight species are frequently ignored by the nursery trade in favor of more showy cultivars. Setting aside discussions of wildlife value and attractiveness to pollinators, today’s discussion was about aesthetics. “Sometimes you just need the basics,” one co-worker announced. 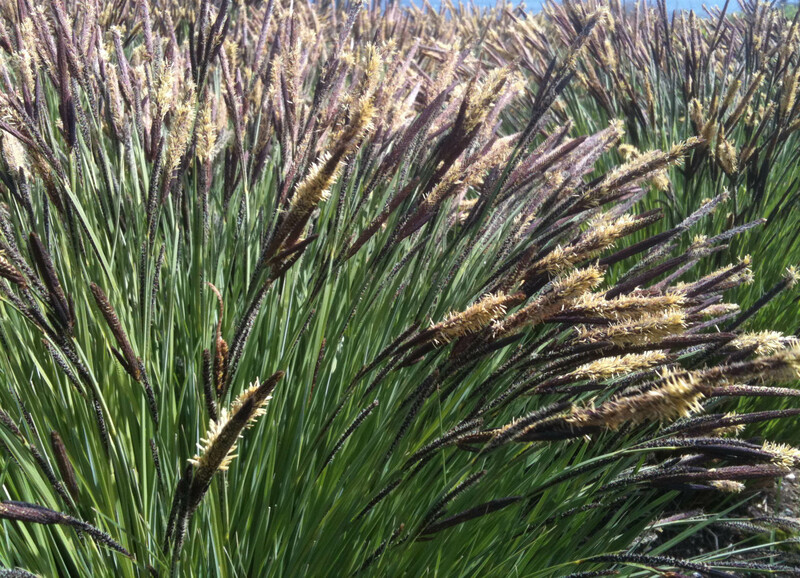 Carex elata is an example of just such a plant. Not to be outshown by its more widely cultivated chartreuse form, ‘Bowles Golden’, the straight species of Carex elata has found a welcome home in many OvS gardens over the years. Eric Groft and Wolfgang Oehme first happened upon the straight species decades ago at Holgar Winenga’s Garden Treasure Nursery. I vividly remember the fury of Wolfgang Oehme when a truckload including thousands of cheerily glowing ‘Bowles Golden’ arrived at a prominent federal project we were working on, instead of the specified straight species. “They look sick,” snapped Wolfgang as he ordered the plants returned. No intense yellow sedges here! The straight species features graceful, slender, emerald-green blades. 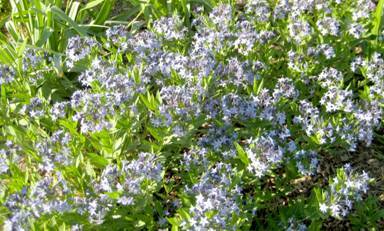 Clusters of deep brown seed capsules shoot like fireworks off the stems in mid-April. 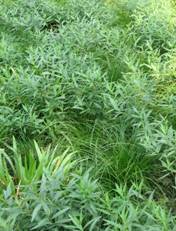 When planted in mass, Carex elata forms a dense waving sea of green by early summer. 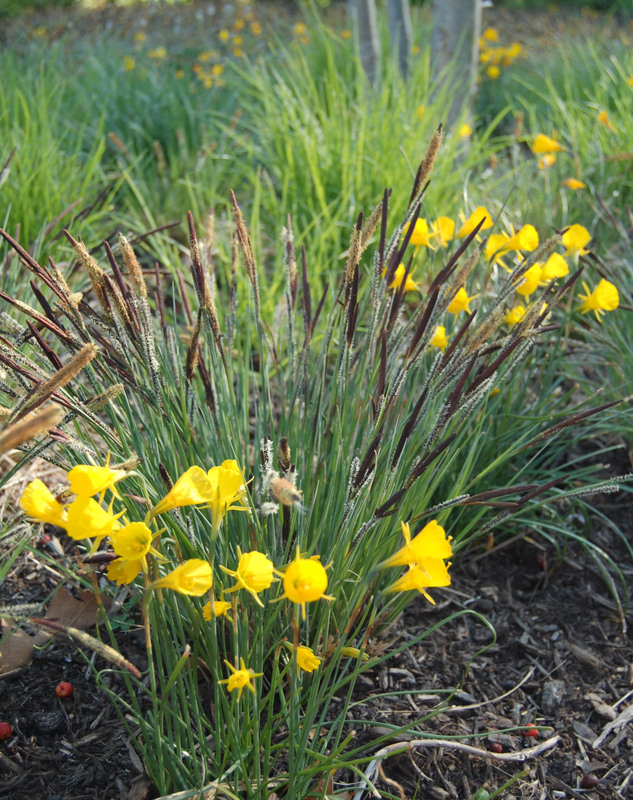 The versatile plant performs well in sun or shade, moist or dry conditions. “It’s a miracle plant!” declares OvS principal Eric Groft. 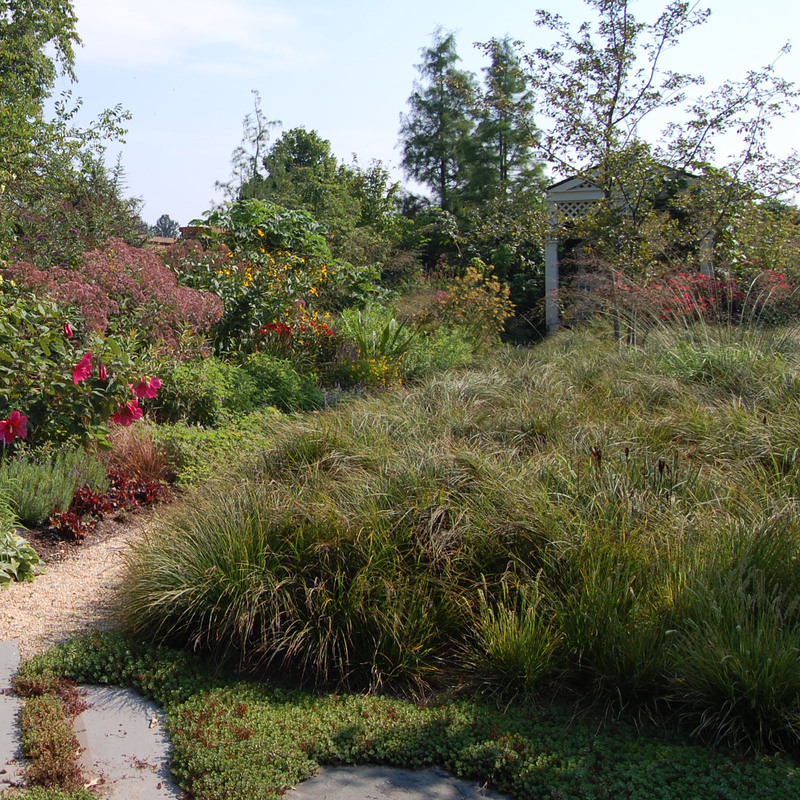 Carex elata demonstrates just how beautiful and dynamic the basics can be. A walk through an eastern woodland in early spring is a treasure hunt for me. Only in this short window of time, before deciduous trees leaf out and while the sun still reaches the forest floor, does one have the opportunity to discover the fleeting blooms of our native spring ephemerals. 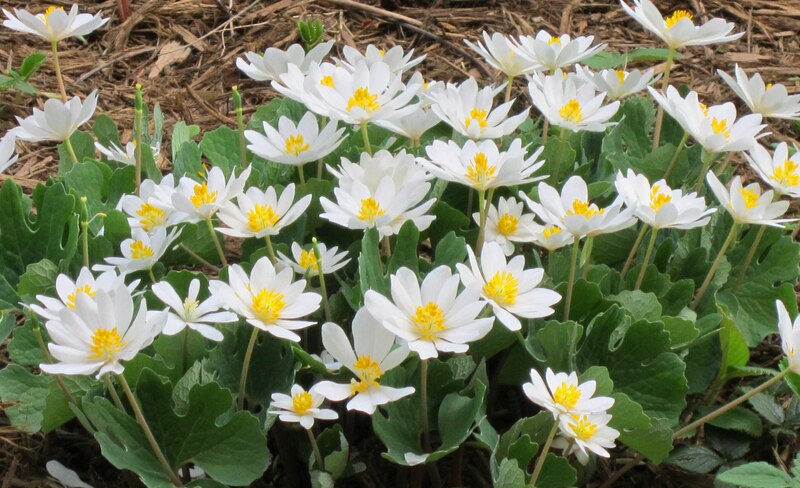 This weekend, I spied some of the earliest of these, a happy colony of Bloodroot, its blossoms grouped in a gleaming white bouquet. 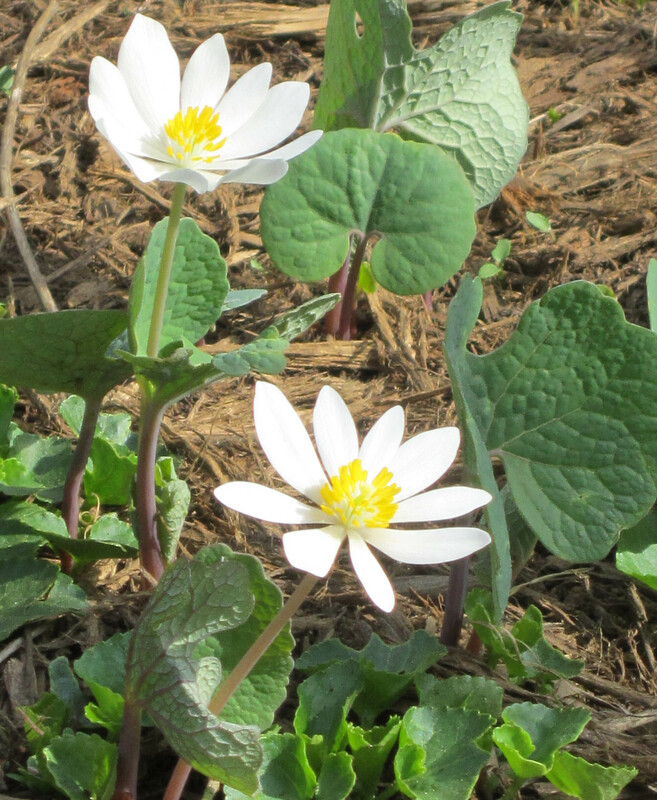 Bloodroot’s flower buds emerge in early spring wrapped tightly in a leaf that shares their same stem and that may help to trap warmth. The showy clear white blossoms with yellow stamens open in the sun and close at night. 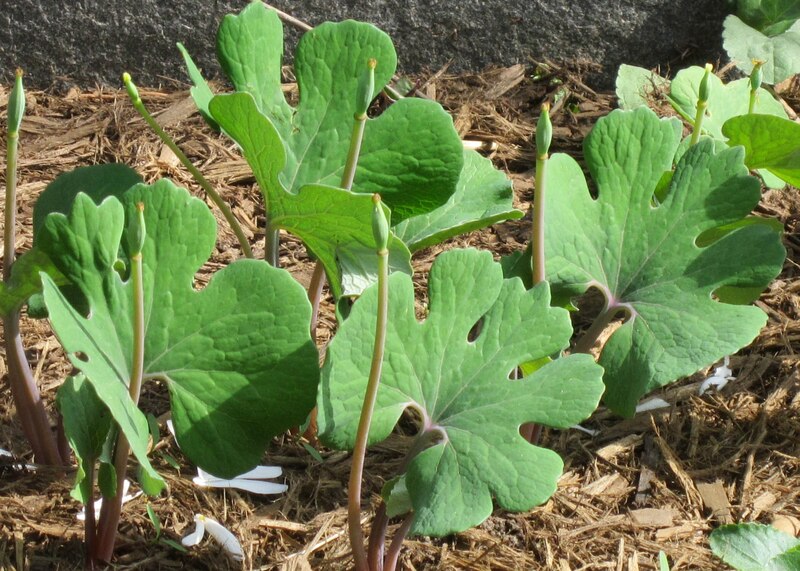 Bloodroot’s large leaves fully unfurl after the flowers fade. 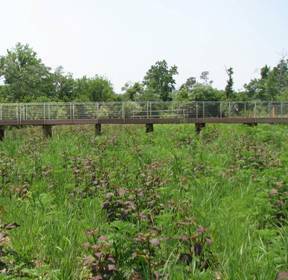 The leaves are strongly textural with deep clefts, and they in turn disappear in mid-summer when bright sunlight no longer reaches the forest floor. 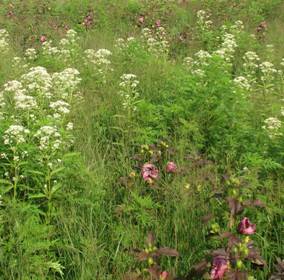 The metaphorical common name derives from the reddish sap exuded by the roots and stems of the plant when cut. 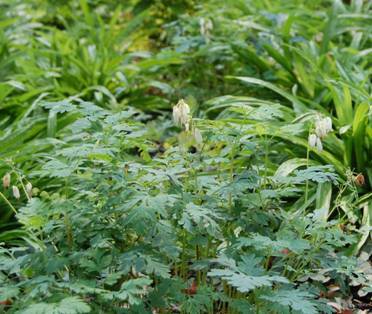 Last spring, OvS planted Bloodroot in several of our projects, tucking the low plants close to woodland paths amongst a richly textured groundplane of ferns and sedges like Dryopteris marginalis and Carex plantaginea that fill in as Bloodroot goes dormant. This spring, I am thrilled to watch as these delicate woodland beauties have their day in the sun. Though this has been a particularly mild winter in Washington DC, I still find myself watching intently for signs of spring. This week, the Paperbush outside my front door has rewarded me by unfurling its unusual spherical yellow flowers. The dangling blossoms hang like large pendants from the bare stems. Welcome spring! 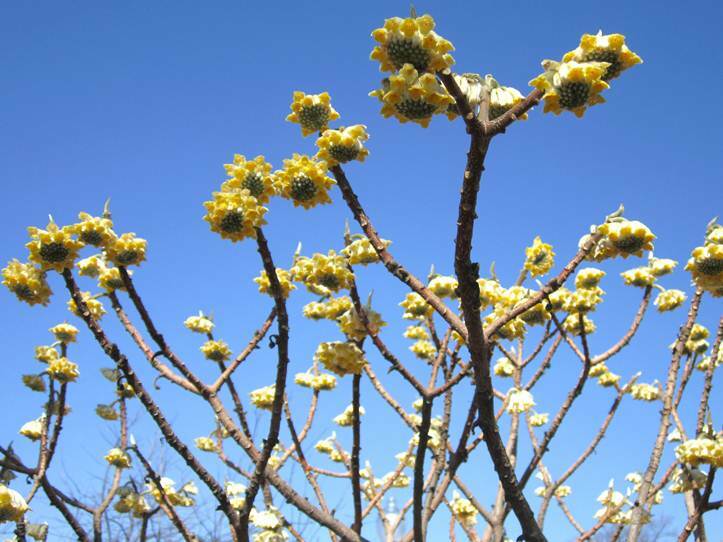 Paperbush’s silvery leaves emerge after it is done blooming and are reminiscent of Frangipanis. DC is near the northern edge of Paperbush’s hardiness range, and through the spring, summer, and fall it looks like its tropical cousins. Its graceful, vaselike form, smooth reddish bark, and prominent buds that form in late summer keep gardeners enticed through the winter. At OvS, we use it as a stand-alone specimen shrub in spots where it will be sure to be appreciated in late winter (near a front door or sunny terrace, or prominently visible outside an important window). Its sweet fragrance fills the air and gives all who pass by a breath of spring.